How can a hypervisor be deployed with a minimal amount of downtime, while allowing for quick updating and upgrading? A method of deploying hypervisors that allows them to be easily updated and upgraded without causing too much downtime is required. 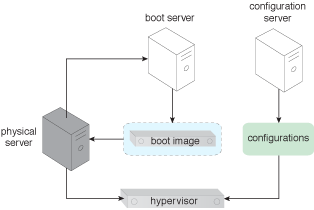 A hypervisor is booted from a boot image and its configurations are loaded every time the hypervisor restarts. 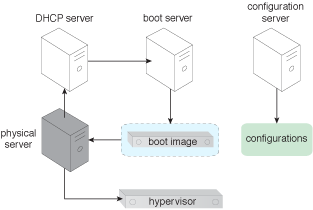 A boot server that can load a given hypervisor and its configurations into memory every time the hypervisor restarts is implemented. The components involved in applying this pattern and their interactions are shown. 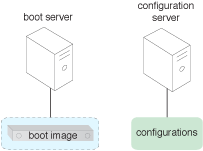 The boot server that maintains the boot image is shown. 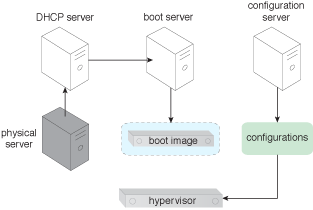 A configuration server containing the hypervisor’s configuration settings is added to the environment. 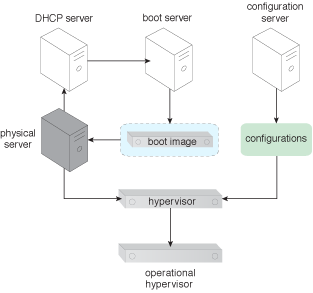 The DHCP server points the hypervisor to the boot server when it powers on. After the physical server loads the boot into its memory, the hypervisor is powered on and becomes operational. The configuration settings are applied to the hypervisor, which becomes operational. 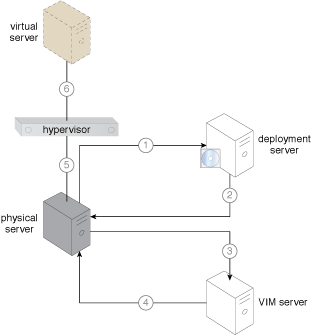 A stateless hypervisor becomes operational after this pattern is applied.